A total of 40 students in fifth through eighth grades competed Jan. 12 in the annual District Spelling Bee at Templeton Middle School. The “district” is a geographical area defined by CESA #1, which sponsors district and regional bees. Four Hamilton School District elementary schools, Templeton Middle School, St. Agnes in Butler, St. John’s in Lannon and Peace Lutheran Academy in Sussex constituted a district for the purpose of the spelling bee. Students who won classroom spelling bees vied for the honor of participating in the district event. The champion speller was Emily Wedell, an eighth-grader from St. John’s. Finalists who will also advance to the regional bee, which will be Feb. 15 at Templeton, were: Alex Leitner from St. Agnes, Mitch Ortlieb from Templeton, Rushil Patel from Marcy, and Alex Saunders from Templeton. In honor of their spelling achievement, the top five spellers received trophies and all students received certificates. 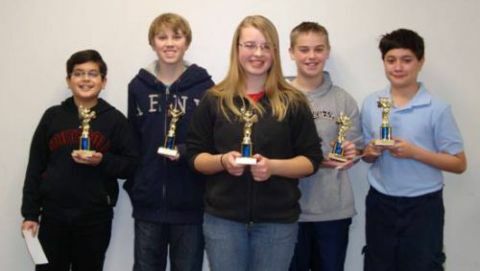 St. John’s – Jesse Fryda, Bryce Marohn, Mandy Schneider, Emily Wedell. Templeton reading specialist Patty Sankey, who coordinated the Spelling Bee, expressed appreciation to the Templeton Home & School organization for its support of the event.